Icelandair is the main airline of Iceland, headquartered at Reykjavík Airport in Reykjavík. It is part of the Icelandair Group and, during the summer of 2015, operated scheduled services to 39 cities in 16 countries on both sides of the Atlantic Ocean out of its hub at Keflavík International Airport. The geographical position of Iceland allows one-stop transatlantic flights, which are one pillar of the airline's business strategy, along with traffic to and from the country. The first Flugfélag Íslands Douglas DC-4, dubbed Gullfaxi, arriving at London Heathrow Airport in June 1953. Icelandair traces its roots back to 1937, when Flugfélag Akureyrar was founded in Akureyri on the north coast of Iceland. Flight operations started in 1938 with a single floatplane of the type Waco YKS-7. In 1939 the airline was grounded when this aircraft was destroyed in a capsizing accident. The company moved to Reykjavík, where it acquired another Waco aircraft and was re-launched in 1940 as Flugfélag Íslands, which translates as Flight Company of Iceland. Previously, two unrelated airlines of the same name had existed in the country (from 1919 to 1920, and between 1928 and 1931). For international purposes, the name Iceland Airways was adopted. The fleet was expanded with a Beechcraft Model 18 in 1942, and with two de Havilland Dragon Rapide as well as one U.S.-made Consolidated PBY Catalina in 1944, the latter being the first ever aircraft registered in Iceland to be flown to Iceland by an Icelandic crew from North America. On 11 July 1945, this aircraft operated the first commercial flight over the Atlantic Ocean for the airline, which led from Reykjavík to Largs in Scotland, with four passengers and four crew members on board. Regular flights to Prestwick Airport, Scotland and Copenhagen in Denmark, using B-24 Liberator aircraft leased from Scottish Airlines were launched in 1946. In the same year, comfort and performance of domestic flights in Iceland could be improved with the introduction of the Douglas DC-3 Dakota. A total of six airliners of that type had been purchased, which remained in service with the airline until 1972, the oldest one being still flightworthy as of 2011. Until the late 1960s, Flugfélag concentrated mostly on domestic flights, where it initially faced fierce competition from Loftleiðir, another airline which had been founded in 1944. When a merger proposal of the Icelandic government was rejected by the two airlines, the domestic routes were split among them as a measure to ease competition. When Loftleiðir pulled out of the domestic market in 1952 to fully concentrate on international flights, Flugfélag became the main domestic carrier of the country. 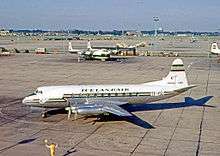 Icelandair Vickers Viscount at London Heathrow Airport in 1962.
International services stayed part of the business model of Flugfélag, though to a far lesser extent compared to Loftleiðir. In 1948, the Douglas C-54 Skymaster was introduced on those routes, and in 1957 two new Vickers 759 Viscounts were acquired, the first turboprop airliners to be operated by an Icelandic airline. In the 1950s, Flugfélag began to use the Icelandair branding for its international flights. In 1967, Flugfélag was the first Icelandic airline to join the jet age, when a Boeing 727-100 dubbed Gullfaxi was put into service. Another 727 was acquired in 1971, and the aircraft type was operated until 1990. In 2008, the cockpit section of the Gullfaxi was put on display at the Akureyri Aviation Museum. Another company called Loftleiðir had been formed in 1944 by three young pilots returning from their flight training in Canada. Their company, whose name roughly means "Skyways", concentrated on Icelandic domestic air services for the first few years. The first planes used were two Stinson Reliants, and then a Grumman Goose amphibious aircraft. At first, Loftleiðir, like Flugfélag Íslands, concentrated on domestic air services. Loftleiðir began scheduled international operations in 1947. By 1952, the Icelandic authorities were very worried that fierce competition between both Icelandic airlines would ruin both companies, and attempted to force a merger between them. This did not happen at the time, but instead the authorities split up the domestic routes between the two airlines. As a result, Loftleiðir ceased domestic flights in Iceland entirely, concentrating instead on international flights. Loftleiðir's pioneering low-fare services across the North-Atlantic then commenced in 1953. In a way, Loftleiðir can even be considered a sort of precursor of the low-cost carriers that started operating in the 1970s. This made them a popular airline for travel between Europe and North America. The late 1960s were an exciting time for Loftleiðir. In 1969 the company acquired International Air Bahama, a small airline operating DC-8 jet aircraft out of the Bahamas with transatlantic nonstop service between Nassau and Luxembourg, and a year later Loftleiðir became one of the founders of Cargolux, a cargo airline. Also in 1970, Loftleiðir entered the jet age with its first two Douglas DC-8 aircraft. During those years, Loftleiðir were often referred to, even by the company's own staff, as "the Hippie Airline" or even "the Hippie Express". Loftleiðir were not famous for speed or punctuality, but flying with the company became a sort of rite of passage for young "hippies" from America travelling to Europe, one of whom was Bill Clinton, later US President. During the 1970s energy crisis, the economic situation for both Flugfélag and Loftleiðir worsened. 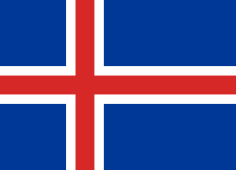 The government of Iceland initiated a new attempt to merge the two airlines, which could be realized in 1973 following lengthy and difficult negotiations. The staff of Loftleiðir complained that Flugfélag, although smaller, had gained the upper hand in the united company. A holding company called Flugleiðir was created, which combined the two companies and began to streamline staff and operations. At the time of the merger, two thirds of the passenger traffic of the airline were international transatlantic crossings, and Flugfélag's fleet of DC-3s and 727s was enlarged by DC-8s of Loftleiðir. In 1979, Flugfélag bought all of Loftleiðir's assets in Flugleiðir, and the airline became known by today's Icelandair. A pair of Icelandair Douglas DC-8s at Luxembourg-Findel Airport (1983). A Boeing 727 of Icelandair approaches London Heathrow Airport in 1983. The aircraft fleet of Icelandair remained mainly unchanged until the Boeing 757-200 became the new backbone for transatlantic flights during the 1990s. The domestic Fokker F-27s were replaced by F-50s and Boeing 737s deployed on European routes. The European hub at Luxemburg-Findel Airport had been taken over from Loftleiðir. Passenger count topped one million in 1995 as the company's business grew on a reputation as a "backpacker airline", similar to Loftleiðir, which had been referred to as "Hippie Airline" since the late 1960s. In the same year, it was begun to dismantle the Luxemburg hub in favor of today's decentralized European network, linking the largest cities non-stop to Reykjavík. In 1997 the domestic operations of Icelandair, part of which had previously been operated under the Flugfélag Nordurlands branding, were combined with small airline Nordurflug to form the Air Iceland subsidiary, allowing mainline Icelandair to fully concentrate on international flights since then. In 1999, a new aircraft livery was introduced, as part of an image campaign designed to retire Icelandair's "backpacker" label in favor of an emphasis on business travel. From 2001, the Icelandair hub was moved to Keflavík International Airport. As Icelandair particularly focuses on flights to North America, the company was significantly affected by the airspace closure following the September 11 attacks in the same year. The Flugleiðir holding was reorganized as Icelandair Group (for aviation business) and FL Group (for non-aviation finance and investment business) between 2002 and 2005, with Icelandair becoming the largest and most important of eleven subsidiaries. The wet-lease and charter department, which was founded in 2003, was named Loftleiðir Icelandic, thus re-introducing a familiar name. TF-FIU (Hekla Aurora), an Icelandair Boeing 757-200 in a special livery depicting the aurora borealis or northern lights, departs Geneva Airport. Like most Icelandic companies, Icelandair was hit quite hard by the 2008 financial crisis in the country, but was well on the road to recovery when another crisis of a very different kind hit in 2010. The air traffic restrictions following the 2010 eruptions of Eyjafjallajökull resulted in large parts of the European airspace being closed down. The air travel disruption coincided with the start of the important summer season for the company. The in-house crisis management organization began assessing the situation once the scale of the problem had become known. Thrice-daily crisis meetings were held at the airline's headquarters. Icelandair tried to operate as many passenger flights as possible, keeping its hub at Keflavík open and diverting European flights to airports that were still open, such as Glasgow International Airport and Trondheim Airport. The eventual closure of Keflavík due to the volcanic ash cloud coincided with an improvement of the situation towards Europe, which allowed Icelandair to move its headquarters with 200 staff to Glasgow and operate flights from there for ten days, with shuttle flights to Iceland's Akureyri Airport and round-the-clock bus shuttles onwards to Reykjavík. In the aftermath of the eruption, the government of Iceland launched the successful "Inspired by Iceland" campaign to regain confidence in travelling to Iceland for tourists and business people, of which Icelandair was a leading participant and initiator. When the Grímsvötn volcano erupted in 2011, Icelandair once again had to cope with airspace closures in Europe, though this time to a lesser extent due to a higher level of political preparedness. Weekly newspaper The Economist claimed that Icelandair could even take advantage when catering for disaster tourists. In February 2011 Icelandair was chosen "The Knowledge Company" of the year and Icelandair CEO Birkir Hólm Guðnason was picked as "Man of the Year" in the Icelandic business community. In both categories the panel of judges of the Association of Economists and Business Graduates in Iceland said that "the fine results of the company in the previous year showed both a high degree of skill and specialist knowledge within the company as well as excellent leadership." In October of the same year, the airline was awarded the title "Marketing Firm of the Year in Iceland", by a judging panel from IMARK, the Marketing Association in Iceland. After having launched scheduled flights to Washington D.C. in 2011, Denver was announced as a new U.S. destination for 2012, followed by Anchorage in 2013, bringing the total number of cities served in the country up to eight, along with Boston, Minneapolis, New York City, Orlando and Seattle. Also in 2012, Icelandair resumed domestic services, with regular flights linking Akureyri to its Keflavík hub through subsidiary company Air Iceland. Further expansion of Icelandair’s global network was announced on May 12, 2015 with new, year-round services from Chicago O’Hare International Airport, connecting the city with over twenty European destinations. Services commenced on March 16, 2016 with flights to Iceland operating four days a week, on Mondays, Wednesdays, Fridays and Sundays. On August 17, 2015 Icelandair announced the augmentation of their global flight network with a new service between Keflavik (KEF) and Aberdeen (ABZ), the company’s second Scottish destination. The new service, which will be operated by Air Iceland (a subsidiary of Icelandair Group), commences on March 9, 2016 with flights scheduled four times per week, departing on Mondays, Wednesdays, Fridays and Saturdays. Service to Montreal, Canada will begin May 26, 2016. Icelandair will start scheduled flights to Paris Orly Airport (ORY) beginning March 29, 2016. Since the 1960s, Icelandair has offered passengers travelling on transatlantic flights between North America and Europe an opportunity to stopover in Iceland for up to seven days, at no additional cost. In order to raise awareness about their stopover offer, the company launched a new social media initiative in 2014, with the hashtag #MyStopover. On February 13, 2013 Icelandair Group announced that the company had finalized an order with Boeing for sixteen new Boeing 737 MAX planes. Purchase rights for eight additional 737s had also been signed. The value for all sixteen aircraft was USD 1.6 billion at Boeing list prices, but actual purchase price was confidential. The planes will be delivered in 2018-2021. In a press release from Icelandair Group Björgólfur Jóhannsson, president and CEO of the company enthused: "The first aircraft is scheduled to be delivered in the first half of 2018 and the aircraft will be operated alongside with the Company’s current fleet of Boeing 757s." The order is for nine 737 MAX 8 airplanes for 153 passengers and seven 737 MAX 9 aircraft which hold 172 passengers. In comparison, Icelandair Group’s current Boeing 757-200 aircraft hold 183 passengers. Boeing 737 MAX is a new, improved and longer version of the present Boeing 737s. Fuel savings compared to Icelandair's present fleet of Boeing 757s are thought to be more than 20% per seat. Icelandair offers three booking classes: Economy, Economy Comfort and Saga Class (the last being equivalent to business class). Free meals are only available in Economy Comfort and Saga Class, and a buy on board service is provided for Economy Class passengers. All of Icelandair's aircraft are equipped with a free of charge AVOD in-flight entertainment system that includes seatback, touch-screen monitors for each passenger. The airline claims to be especially children-friendly. At-cost meals, blankets, pillows and headsets are provided, and the inflight system hosts a selection of children's movies. Almost all of Icelandair's fleet is equipped with in-flight WiFi, provided by Row 44. The installation of WiFi in all the airline's B757-200/300 is expected to be completed by the autumn of 2015. Special Assistance is provided for travelling with pets, young travellers and infants, and Special Service, e.g. for blind people with seeing-eye dogs, expectant mothers, wheelchair service, POC systems. Icelandair Info, the inflight magazine of Icelandair, is printed four times a year in Icelandic and English. First published in 2008, it is also the product catalogue for the airline's Saga Shop. The frequent flyer program of the airline is called Saga Club. On 1 April 2013 Icelandic band Sigur Rós debuted their latest album, Valtari, exclusively onboard Icelandair's planes, two months before the album's general release. Biophilia, Björk's 2011 album, had earlier been released on Icelandair's fleet in the same way. Icelandair flies from Iceland to 27 destinations in Europe and 16 destinations in North America. A few of these destinations are seasonal. Boeing 737 MAX 8 — 9 16 137 153 Deliveries 2018 to 2021. Boeing 757-200 25 — 22 161 183 Older aircraft to be replaced by 737 MAX. All of the aircraft in Icelandair's fleet are named after Icelandic volcanoes. In 2005, the airline, on behalf of its parent company Icelandair Group, announced an order for ten Boeing 737-800 aircraft with options for five more. Those options were later exercised. These were not placed into service by the airline but leased to other airlines. During that same year, Icelandair announced an order for two Boeing 787 Dreamliners. In 2006, Icelandair announced an order for two more Boeing 787s. In 2011, it was announced that orders for three of the 787s had been cancelled. On December 6, 2012, the airline committed itself to ordering the upcoming Boeing 737 MAX aircraft, eight of which will be the MAX 8 and four the MAX 9. The Icelandair Group operates a number of other subsidiary airlines. Loftleidir-Icelandic operates on the international aircraft leasing market. The company leases out 4 Boeing 757-200s, 3 Boeing 767-300s, 1 Boeing 737-700 and 2 Boeing 737-800s. Icelandair Cargo specialises in air freight cargo to and from Iceland, operating 2 Boeing 757-200s. Air Iceland is a mostly domestic airline, but also maintains regular flights to and from Greenland, the Faroe Islands and Aberdeen in Scotland. The company operates 5 Bombardier Dash 8s. Icelandair has adopted a strict environmental policy in keeping with Iceland's image as an unspoiled country with clean air, water, sea and nature in general. The goal of this policy is to minimize Icelandair’s total environmental impact and to establish sustainable practices by optimizing the use of the resources at the company's disposal. This is done in a variety of ways, from recycling paper in the company's office to trying to create one of the "greenest" ground crews in the industry at Keflavik Airport to inviting passengers to participate in planting trees. As one of Iceland's largest companies, Icelandair sponsors many events and charities. The company is, together with the City of Reykjavík, the main sponsor of the hugely popular Iceland Airwaves, the annual music festival held in Reykjavík on the first weekend in November. The festival spans five days (Wednesday–Sunday) and its main focus is showcasing new music, both Icelandic and international. On 29 May 1947, a Flugfélag Islands (as the airline was known at that time) Douglas C-47 Skytrain (registered TF-ISI) crashed near Hjedinsfjordur during a scheduled domestic flight from Reykjavík to Akureyri, killing the 21 passengers and four crew on board. To date, this remains the worst aviation accident in Iceland. On 7th March 1948, a Avro Anson Mk5 belonging to Loftleidir crashed on the mountain Skálafell enroute from the Westmann Islands (Vestmannaeyjar) to Reykjavík, killing all 6 persons on board, one pilot and five passengers. On 31 January 1951, the 17 passengers and three crew members on board another C-47 (registered TF-ISG) were killed when the aircraft crashed into the sea off the Icelandic coast near Hafnarfjörður. The pilots were attempting to land the airplane at Reykjavík Airport in heavy snowfalls following a flight from Vestmannaeyjar, when radar contact was lost. On 14 April 1963, a Vickers Viscount (registered TF-ISU) crashed on approach of Oslo-Fornebu Airport. All 12 people on board were killed. On 26 September 1970, a Flugfélag Fokker F-27 Friendship (registered TF-FIL) crashed into a mountain near Vágar, Faroe Islands while approaching Vágar Airport following a scheduled passenger flight from Bergen, in what is known a controlled flight into terrain. Of the 34 people on board, seven passengers and one crew member were killed. On 15 November 1978, due to a fault on the ground based ILS ( Instrument landing system) transmitter, the Douglas DC-8 (registered TF-FLA) missed the runway upon approach of Colombo Airport in Sri Lanka during a chartered Hajj pilgrimage flight from Jeddah and crashed. 74 passengers and 5 crew members survived the accident. The disaster of Flight LL 001 (a Loftleiðir flight number, but the company had merged with Flugfélag at that time) with its 183 fatalities marks by far the worst accident in the history of Icelandic aviation. 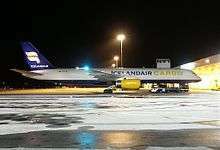 On 22 January 2002, the crew of Icelandair Flight 315, a Boeing 757-200 registered TF-FIO with 75 passengers on board, unintentionally entered a series of extreme manoeuvres during a go-around from a low altitude following an unstabilised approach into Oslo Airport, Gardermoen. During the incident the aircraft was subjected to load factors in excess of the design limits, culminating in a dive followed by a +3.59 g pull up manoeuvre clearing the ground by only 321 ft. The speed limit for the flap configuration was also exceeded. Control was regained and a second approach was flown with the aircraft landing safely. The airliner was permitted to proceed on its subsequent scheduled flights without a technical inspection being conducted until 13 March of that year when its manufacturer Boeing recommended further maintenance work after having evaluated the Flight Data Recorder. The Accident Investigation Board Norway, which led the investigation into the incident, made four safety recommendations, including one to the wider aviation community on operational procedures regarding discontinued approaches. 1 2 "Cheap flights to Europe & Iceland from Boston & more - Icelandair". Retrieved 24 April 2015. ↑ "Icelandair Group". Icelandair Group. 2012-10-01. Retrieved 2012-10-07. ↑ "Directory: World Airlines". Flight International. 2007-04-03. p. 92. ↑ "EC Book". Ecbooks.ecweb.is. Retrieved 2012-10-07. ↑ "Icelandair". Funding Universe. Retrieved 23 May 2011. 1 2 "A brief history commercial Air ICELAND". Flugsafn Íslands. 2009. Retrieved 23 May 2011. 1 2 "Icelandair (ATDB)". Aerotransport.org. 2012-08-06. Retrieved 2012-10-07. ↑ "Frægar flugvélar úr Íslandssögunni". Mbl.is. 2004-01-25. Retrieved 2012-10-07. ↑ "Catalina-flugbáturinn TF-ISP fór fyrsta millilandaflugið". Mbl.is. 2005-06-22. Retrieved 2012-10-07. ↑ "Síðasta dreifing fyrir Landgræðslu" (in Icelandic). Visir. 10 May 2005. Retrieved 23 May 2011. ↑ "Fyrsta þota Íslendinga" (in Icelandic). Morgunbladid. 26 February 2006. Retrieved May 23, 2011. ↑ "Kveðjuflug Heimfara" (in Icelandic). Morgunblaðið. 27 September 1990. Retrieved 23 May 2011. ↑ "Stjórnklefi Gullfaxa varðveittur í Flugsafninu á Akureyri" (in Icelandic). Morgunblaðið. 29 March 2008. Retrieved 23 May 2011. ↑ "ss07130.jpg Grumman flugbátur Loftleiða 1946". Photos.is. Retrieved 2012-10-07. ↑ "Hálf öld frá fyrsta flugi Loftleiða til Ameríku". Mbl.is. 1998-08-27. Retrieved 2012-10-07. 1 2 "Frjáls verslun, 40. árgangur 1981, 4. tölublað". Timarit.is. Retrieved 2012-10-07. ↑ Sigurgeir Orri Sigurgeirsson. "Bloggfærslur mánaðarins, maí 2009". sigurgeirorri.blog.is. Retrieved 2012-10-07. ↑ "Atburðir í flugsögu Íslands" (in Icelandic). Caa.is. Retrieved 2012-10-07. ↑ "FIMMTÍU ÁR FRÁ STOFNUN LOFTLEIÐA Stærsta ævintýri lýðveldisins Jakob F". Mbl.is. Retrieved 2012-10-07. ↑ "Orrustan um Loftleidir" (PDF). Sgurgeirorri.org. Retrieved 2012-10-07. ↑ "Loftleidir". Issuu.com. 2010-09-02. Retrieved 2012-10-07. ↑ "Alfred Eliasson & Loftleidir Icelandic". IMDb.com. Retrieved 2012-10-07. ↑ Brothers, Caroline (17 February 2009). "Sigurdur Helgason, 87, Airfare Pioneer, Dies". The New York Times. ↑ "Flugstjórar Skymaster-vélarinnar Heklu". Mbl.is. Retrieved 2012-10-07. ↑ "Efnisyfirlit" (PDF). Skemman.is. Retrieved 2012-10-07. ↑ "Loftleiðir Icelandic Airlines". knol. Retrieved 2012-10-07. ↑ Steingrímsdóttir, Steinunn Edda (23 May 2011). "Icelandair hafði áhrif á samband Hillary og Bill Clintons - Hitti Össur fyrir stundu í USA" (in Icelandic). Pressan. Retrieved 23 May 2011. ↑ "Frjáls verslun, 40. árgangur 1981, 9. tölublað". Timarit.is. Retrieved 2012-10-07. ↑ "Hlakkaði alltaf til næsta dags" (in Icelandic). Morgunblaðið. 15 October 2003. Retrieved 23 May 2011. ↑ "mbl.is". mbl.is. Retrieved 2012-10-07. ↑ "1.578 milljóna króna tap á fyrri árshelmingi". Mbl.is. 1998-08-21. Retrieved 2012-10-07. ↑ "Innanlandsflug Flugleiða verður sameinað Flugfélagi Norðurlands undir nafninu". Mbl.is. Retrieved 2012-10-07. ↑ "A reliable long term partner". Loftleidir.com. Retrieved 2012-10-07. ↑ "Presentation of the measure taken by Icelandair to cope with the 2010 air travel disruptions" (PDF). Keilir.net. Retrieved 2012-10-07. 1 2 "Icelandair and the Eyjafjallajökull volcanic eruption in 2010". Icelandair. Retrieved 23 May 2011. ↑ "Icelandair shifts volcano-hit hub operation back to Reykjavik". Flightglobal.com. 2010-04-28. Retrieved 2012-10-07. ↑ "Iceland continues to inspire with successful tourism campaign". Icenews.is. Retrieved 11 May 2011. ↑ "Inspired by Iceland campaign continues to boost tourism in Iceland". eNewsWire UK. 13 May 2011. Retrieved 23 May 2011. ↑ Valdimarsdóttir, Anna; Pálsdóttir, Inga Hlín. "Joining Forces: Inspired by Iceland". Tourism Review. Retrieved 23 May 2011. ↑ "Inspired by Iceland Video". YouTube. Retrieved 2012-10-07. ↑ "UK 'better prepared' for volcanic ash than last year". BBC. 22 May 2011. Retrieved 23 May 2011. ↑ "Flights cancelled as ash cloud heads towards UK". BBC News. 23 May 2011. ↑ "Come to Iceland!". The Economist. 28 May 2011. 1 2 "Icelandair hlaut Þekkingarverðlaunin 2011 - Fréttir - Samtök atvinnulífsins". Sa.is. 2011-02-25. Retrieved 2012-10-07. ↑ Archived December 31, 2011, at the Wayback Machine. ↑ "Icelandair Announces Flights from Washington, D.C". Icelandair.us. 2012-08-24. Retrieved 2012-10-07. ↑ "Icelandair Takes Off from Denver". Icelandair.us. 2012-08-24. Retrieved 2012-10-07. ↑ "Flug Icelandair frá Akureyri hefst í dag". Retrieved 24 April 2015. ↑ "Icelandair Announces Growth Plans for 2014 - Icelandair". Retrieved 24 April 2015. ↑ "Icelandair to fly from Birmingham to Iceland, USA and Canada". Retrieved 24 April 2015. ↑ "Icelandair Group announces continued growth in international flights for 2015". Retrieved 20 July 2016. ↑ "Icelandair Announces Service from Chicago O'Hare - Icelandair.us". Retrieved 20 July 2016. ↑ "Icelandair Introduces Service to Aberdeen, Scotland - Icelandair.us". Retrieved 20 July 2016. ↑ Press, Canadian. "Icelandair to launch seasonal service from Montreal in May". Retrieved 20 July 2016. ↑ "Icelandair Adds Flights to Paris Orly Airport - Icelandair.us". Retrieved 20 July 2016. ↑ "Flickr - Photo Sharing!". Flickr - Photo Sharing!. Retrieved 24 April 2015. ↑ "Hekla Aurora". Retrieved 24 April 2015. ↑ "Explore Iceland on an Icelandair Stopover - Icelandair". Retrieved 20 July 2016. ↑ "Vísir - Icelandair gengur frá kaupum á sextán 737 MAX flugvélum frá Boeing". visir.is. Retrieved 24 April 2015. ↑ "Icelandair Group and Boeing finalize orders for 737 MAX". Retrieved 20 July 2016. ↑ "Saga Shop Kitchen". Icelandair.us. 2012-08-24. Retrieved 2012-10-07. ↑ "Economy Class". Icelandair.us. 2012-08-24. Retrieved 2012-10-07. ↑ "Television shows on board Icelandair". Icelandair.us. 2012-08-24. Retrieved 2012-10-07. ↑ "Icelandair to Offer In-Flight Wi-Fi". Retrieved 24 April 2015. ↑ Row 44, Inc. (31 May 2012). "Icelandair Selects Row 44 To Provide Fleet Wide... -- REYKJAVIK, Iceland and WESTLAKE VILLAGE, Calif., May 31, 2012 /PRNewswire/ --". Retrieved 24 April 2015. ↑ "Traveling with Pets". Icelandair.us. 2012-08-24. Retrieved 2012-10-07. ↑ "Young travelers". Icelandair.us. 2012-08-24. Retrieved 2012-10-07. ↑ "Children and Infants". Icelandair.us. 2012-08-24. Retrieved 2012-10-07. ↑ "Unaccompanied Children". Icelandair.us. 2012-08-24. Retrieved 2012-10-07. ↑ "Special Service". Icelandair.us. 2012-08-24. Retrieved 2012-10-07. ↑ "Icelandair - Flights to Iceland & Europe via Reykjavik, cheap flights with Icelandair". Icelandair.us. 2012-08-24. Retrieved 2012-10-07. ↑ "Sigur Rós debuts Valtari exclusively on board Icelandair". Retrieved 24 April 2015. ↑ "Profile on Icelandair". CAPA. Centre for Aviation. Archived from the original on 2016-10-30. Retrieved 2016-10-30. ↑ "Aircraft Registry Lookup". Icelandic Transport Authority. Retrieved 5 November 2016. Included in the search results is a Cessna 180 owned by one of the airline's pilots. 1 2 3 4 "Icelandair Group and Boeing finalize orders for 737 MAX". Icelandair Group hf. Feb 13, 2013. Retrieved Feb 13, 2013. 1 2 "Boeing Commercial Airplanes – Orders and Deliveries – 737 Model Summary". boeing.com. Boeing. 29 February 2016. Retrieved 22 March 2016. ↑ "Continued growth in international flights in 2016" (Press release). Icelandair Group. ↑ "Icelandair kaupir tvær Boeing 767 til viðbótar" [Icelandair buys two additional Boeing 767s] (in Icelandic). Allt um Flug. 6 May 2016. Retrieved 7 May 2016. 1 2 "Icelandair To Transfer Purchase Rights on Three 787s to Norwegian". Flightglobal. May 26, 2011. Retrieved February 25, 2005. ↑ "The Icelandair aircraft fleet". Icelandair. 2015. Retrieved 2015-05-21. ↑ "Archived copy". Archived from the original on 2012-04-16. Retrieved 2012-12-22. ↑ "Kaupa fimm nýjar Boeing 737-800 flugvélar til viðbótar". Retrieved 24 April 2015. ↑ "FL Group leigir Air China fimm Boeing-velar" [FL Group leases Boeing aircraft to Air China]. mbl.is (in Icelandic). Retrieved 24 April 2015. ↑ "Boeing: Icelandair Orders Two Boeing 787 Dreamliners". Boeing. February 25, 2005. Retrieved August 12, 2012. ↑ "Archived copy". Archived from the original on 2012-03-16. Retrieved 2012-12-22. ↑ "UPDATE 1-Icelandair Says No Plans To Cancel Boeing Orders". Reuters Online. March 26, 2009. Retrieved August 12, 2012. ↑ "Icelandair Group and Boeing have signed a commitment for new aircraft". Retrieved 24 April 2015. ↑ "Boeing". Retrieved 24 April 2015. ↑ "Icelandair Fleet | Airfleets aviation". Airfleets.net. Retrieved 2012-10-07. ↑ "AeroTransport Data Bank". Aerotransport.org. Retrieved 2012-10-07. ↑ "Annual Report 2013". p. 57. ↑ "Annual Report 2013". p. 58. ↑ "Icelandair's Environmental Policy". Icelandair.us. 2012-08-24. Retrieved 2012-10-07. ↑ "Iceland Carbon Fund". Icelandair.us. 2012-08-24. Retrieved 2012-10-07. ↑ "Iceland Airwaves". Iceland Airwaves. Retrieved 24 April 2015. ↑ "ASN Aircraft accident Douglas C-47A-25-DK TF-ISI Hjedinsfjordur". Aviation-safety.net. 1947-05-29. Retrieved 2012-10-07. ↑ Háskólabókasafn, Landsbókasafn Íslands -. "Timarit.is". timarit.is (in Icelandic). Retrieved 2016-11-01. ↑ "ASN Aircraft accident Douglas C-47A-10-DK TF-ISG Hafnarfjördur". Aviation-safety.net. 1951-01-31. Retrieved 2012-10-07. ↑ "Accident description". Aviation Safety Network. Retrieved 6 October 2009. ↑ "ASN Aircraft accident Fokker F-27 Friendship 300 TF-FIL Vagar, Faroe Islands". Aviation-safety.net. Retrieved 2012-10-07. ↑ "Official investigation report into Flight 001" (PDF). Caa.lk. Retrieved 2012-10-07. ↑ "Features: Top 100 Disasters". AirDisaster.Com. Retrieved 2012-10-07. ↑ "2003/07 | aibn". Aibn.no. 2002-01-22. Retrieved 2012-10-07.